I used to seriously slack on my nighttime skin regimen. I was the girl who would rather fall asleep on the couch with a full face of makeup than drag myself over to the sink to wash it off, like I knew I should. There was something so daunting about the whole process of it, that I just skipped it entirely. But that was before. Before I recognized how good having a nightly routine makes me feel and before I stared giving myself the me-time I so desperately needed, at the end of the day. Now I feel completely differently. Now, I can't wait to get home from work and take off the stress and grime of the day, when I wash my face. 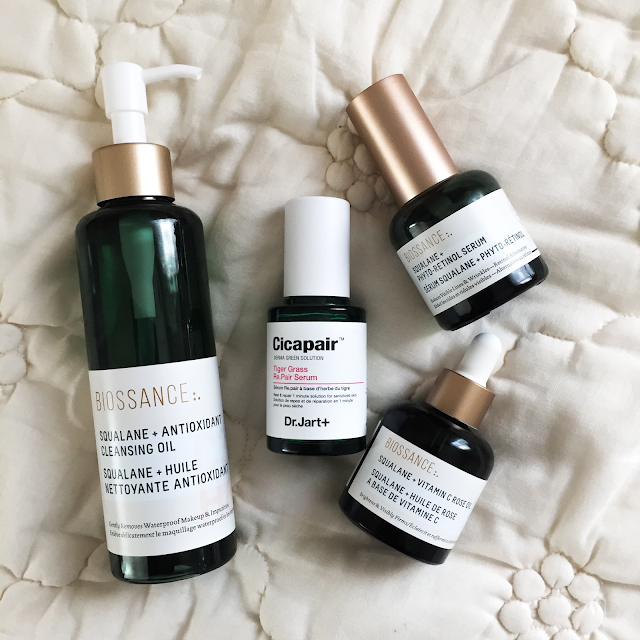 Now, I have a routine that makes my skin feel happy and healthy. Now, I'm addicted to how good I feel when I take care of myself. There's something about the routine of this regimen that's so calming, at night. Not to mention, these babies smell so good that I literally feel like I'm rolling in a meadow of flowers - and how is that idea not instantly relaxing?! 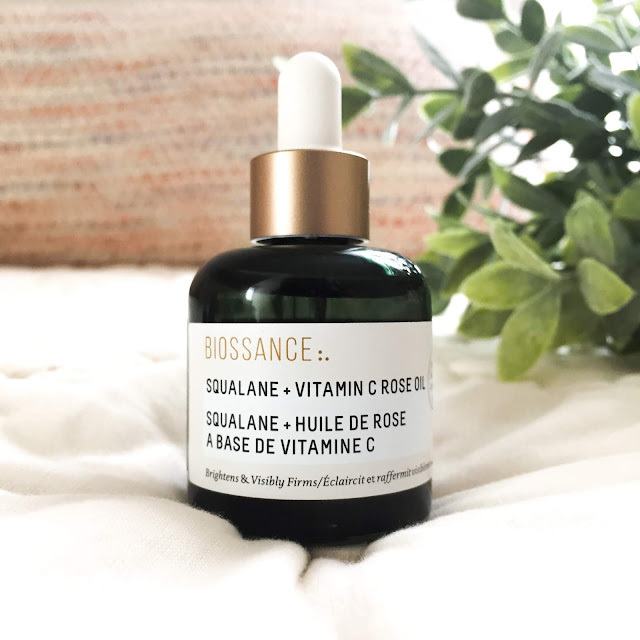 First things first, I wash my face with this cleansing oil from Biossance. It smells so good (again, see the weird comment about rolling in a meadow, above. Not even kidding!). I put it right on my dry face and use a wet washcloth to scrub and wipe it off. And that's it! After washing, I always, always, always use a toner. I was using this one by L'Occitane for the longest time. When I ran out recently, though, I took a recommendation and tried this one by Pixie. And the bottom line, is I love them both. Both are super moisturizing - which is what my combination skin really needs, the majority of the year - and neither one of them cause me any issues with added oiliness. Love! I usually give my skin a few minutes to dry (great time to go make some hot tea, for this relaxing routine. AmIRight?) 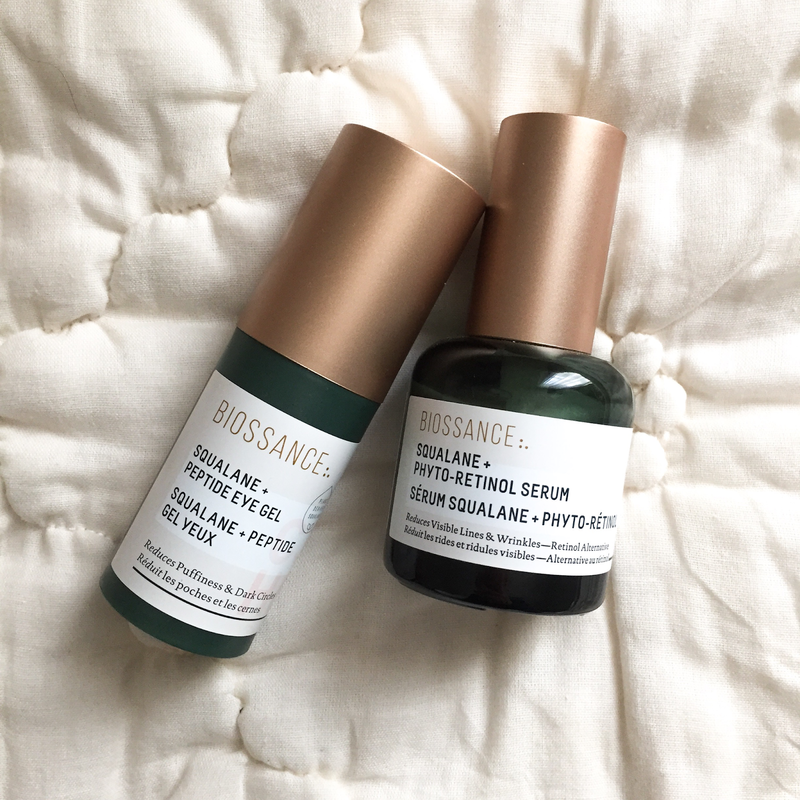 and then indulge in this phyto-retinol serum, by Biossance. It's a great retinol alternative since it's not super-drying like a few other retinol creams, I've tried. Occasionally, I'll add a thin layer of this serum, also by Bare Minerals, if my skin needs a little extra oomph. This baby has literally changed my skin. My biggest insecurity has been the rosiness I have in my cheeks and under my nose. A little bit of this miracle goes a long way. 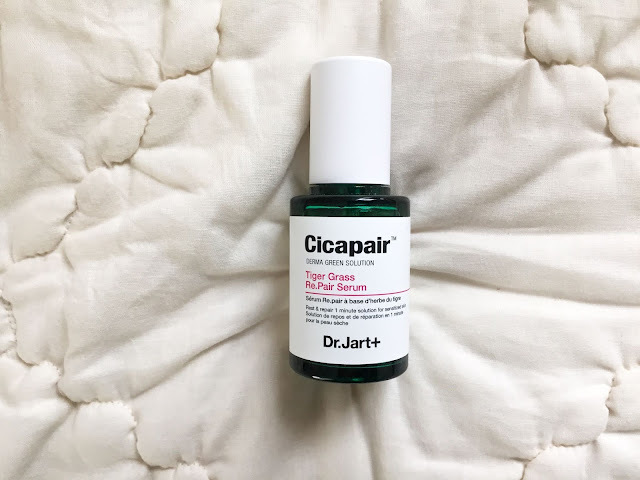 I dab a just little of this Cicapair Tiger Grass Re.Pair Serum on my cheeks and other rosy areas to calm my skin and eliminate any discoloration. Side note: I burnt my hand in the oven last week making these awesome roasted potatoes (a story for another time!) and didn't feel like running ALL the way upstairs to find my aloe burn cream. So, I decided to slather a little dollop of this serum on my hand for kicks, to see if it helped. And BOY DID IT EVER. The next day, my hand was basically back to normal. I'm just saying. I'm convinced this stuff is magic. Before I wrap it all up, I do a super thin layer of Biossance's rose oil. I love love love how my skin feels so super soft and tightened, by the time I wake up. Then, I end my routine with a little eye cream and moisturizer. Throughout the past few weeks, I've really indulged myself with having a nightly routine that I love. Does that mean I need to get up off the couch, instead of falling asleep with all my make up on? Yes... but it has been so worth it! I feel so much better, calmer, and my skin is happier for it, too. To top it off, I haven't felt the need to wear quite so much makeup, because I feel like my skin is being restored back to this state of natural calmness, and I haven't felt the same desire to cover it up with foundations and creams! And no lie, this has been a super positive cycle: great routine, less makeup, clearer skin. If nothing else, this routine has proven to me how important it is to take care of myself; to give myself a little time each night to rest, soak in calmness, and treat myself to something that is good for me.